An complicated crime thriller, Contraband is murky, muddled and mindless. In New Orleans, Chris Farraday (Mark Wahlberg) is a retired smuggler, now happily married to Kate (Kate Beckinsale) and the father of two kids. Kate's younger brother Andy (Caleb Landry Jones) is caught up in a customs raid and has to ditch a cargo of drugs overboard, infuriating gangster Tim Briggs (Giovanni Ribisi), who paid $700,000 for the shipment. Chris and his friend Danny (Lukas Haas) go back into business for one final run to make enough money to pay off Briggs, leaving Kate and the kids in the care of Chris' good friend and former partner-in-crime Sebastian (Ben Foster). 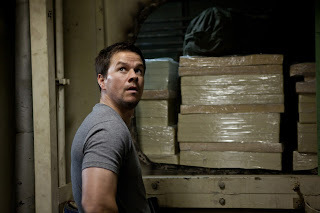 Chris, Danny and Andy board the cargo ship of Captain Redmond Camp (J.K. Simmons) and arrange to pick up high quality counterfeit bills during a stop in Panama City. Once there, they tangle with the heavily armed gang of local criminal Gonzalo (Diego Luna), who is planning his own heist of expensive artwork. Nothing goes according to plan, as Captain Camp becomes suspicious and Briggs sets his sights on terrorizing Kate. Directed by Baltasar Kormákur and an adaptation of an Icelandic film, Contraband is overstuffed with secondary characters, jumps around to numerous side-quests, and stretches credibility well past the snapping point. The tried and tested "one more job" cliche is fine if deployed correctly, but here the job becomes a convoluted make-it-up-on-the-fly mess of shifting objectives and multiple double-crosses among a bunch of crooks, none of them likeable enough to matter. The action scenes are shoehorned into the film for the sake of injecting gratuitous energy boosts. A bloody hold-up of an armoured truck in Panama City leaves multiple fatalities strewn across the road but seemingly no ill-effects or consequences for Chris and his buddies. Earlier, Captain Camp's massive cargo ship slams into the docks, with several containers toppling to shore, all as part of an engine sabotage plot to gain Chris some on-shore time. The investigation of the crash starts and ends with one customs official waving her arms about. Meanwhile the film's entire premise is undermined and suspect: Chris appears easily capable of physically and emotionally intimidating bad guy Briggs whenever he chooses to, calling into question the entire reason why Chris re-enters the life of crime to save Andy's hide. Despite some shadings of style and no shortage of talent in the cast, Contraband is overplotted and underwhelming.